LONDON - Pearson's Financial Times has launched the UK's first approved Barack Obama-led advertising campaign at outdoor poster sites across London and the South East today (15 June). Created by DDB, with media planning and buying by WPP's Maxus, two different large poster images will run for four weeks across more than 50 outdoor commuter sites, including Waterloo, Euston and Victoria stations. One features Barrack Obama addressing a sea of faces, while another shows the US President talking to 10 country leaders, including Prime Minister Gordon Brown, French President Nicolas Sarkozy and German Chancellor Angela Merkel. 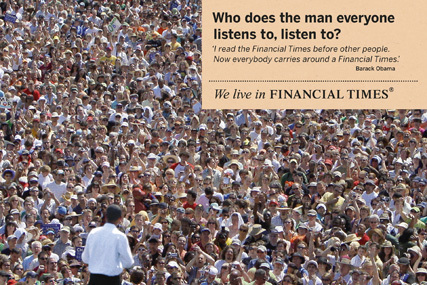 The ads continue the newspaper's "We live in Financial Times" campaign and carries the strapline: "Who does the man everyone listens to, listen to?" "I read the Financial Times before other people read the Financial Times. Now it's trendy and everybody carries around a Financial Times." Caroline Halliwell, director of brand & B2B marketing at the Financial Times, said the quote, made in the first interview for a global publication after Obama took office, demonstrated that "some of the world's most powerful people turn to us as a trusted source of news and analysis". The FT is among the world's leading business news organisations, printed at 23 sites and claiming a worldwide readership of 1.3 million. The UK title had a daily circulation of 410,928, according to ABC figures for May. News International's The Times was the first UK newspaper to feature Barack Obama in an advertising campaign, in a series of unbranded outdoor London commuter ads last September, before Obama was elected President.